Until as recently as the 1950's the majority of boats on the Thames were working boats. Now pleasure boats (a term coined by the working boatman) have taken over. As well as many passenger ferries. Nice composition , the thames is so blue ... why are there so many cranes in the background ? I love the little shed in the thames by Big Ben for the boats- mega cute! These look like ordinary working boats to me. But I am not educated on such things. I have never seen any of these in person so I would not know. What would you do on them if they are just pleasure boats? Wonderful vivid colours and ... what a blue sky! It has been raining hard for two days here in Italy, instead. A nice day to you Mo and to all your online friends. It was´my pleasure to see those boats. Beautiful photo! The colors are gorgeous. 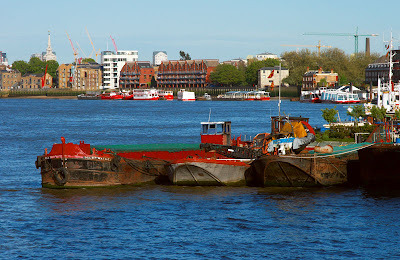 Shame that the Thames isn't used for cargo anymore, if it was it'd help with the congestion! i would like to do some picture blogging with you. would you blog some picture of london on me because i really love london and love to visit some day there. I think you take stunning pictures. Keep in touch and keep blogging with me.